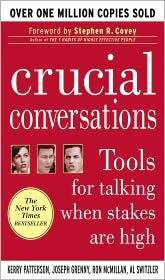 "Crucial" conversations are interpersonal exchanges at work or at home that we dread having but know we cannot avoid. How do you say what needs to be said while avoiding an argument with a boss, child, or relationship partner? Crucial Conversations offers readers a proven seven-point strategy for achieving their goals in all those emotionally, psychologically, or legally charged situations that can arise in their professional and personal lives. Based on the authors' highly popular DialogueSmart training seminars, the techniques are geared toward getting people to lower their defenses, creating mutual respect and understanding, increasing emotional safety, and encouraging freedom of expression. Among other things, readers also learn about the four main factors that characterize crucial conversations, and they get a powerful six-minute mastery technique that prepares them to work through any high-impact situation with confidence. Not your typical resource for the worshiper and worship leader but a must for anyone who interacts with people. These helpful tips will come in handy as you work with volunteers in your churches and in your own homes.  Buy Crucial Conversations Now!